Atlantic City, NJ, (April 6, 2017) – The New Jersey Builders Association (NJBA) honored the industry’s most creative and successful sales and marketing professionals at the 30th Annual Sales and Marketing (SAM) Awards Banquet this evening, at the Golden Nugget Casino, Hotel & Marina in Atlantic City. The awards show marked its 30th Anniversary with a spectacular event which concluded the 68th Annual Atlantic Builders Convention. The Sales & Marketing Awards program honors Builder, Remodeler & Associate Members of the New Jersey Builders Association who have made major contributions to the home building industry by displaying excellence in design and marketing. The SAM Awards Banquet was attended by over 450 advertising, sales, marketing, media, and home building industry professionals. 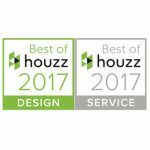 Awards were presented in specialized categories recognizing industry leading sales and marketing initiatives in residential marketing, architectural design, remodeling, and individual creative achievements. Builders, as well as companies that supply products and services to the building industry, are eligible for a SAM Award. Now in its 68th year, ABC is the largest building industry trade show in the Northeast, drawing thousands of participants from the Northeast region, including residential and commercial builders, developers, remodelers and subcontractors, plus a variety of manufacturers, suppliers, and consulting professionals. The convention features hundreds of exhibits showcasing the latest products and services to a large and diverse audience of decision makers. Attendees gain up-to-date information about the latest market trends, government policies and technical developments at educational seminars. Additional information is available at ABConvention.com. NJBA is a housing industry trade association of builders, developers, remodelers, subcontractors, suppliers, engineers, architects, consultants and other professionals dedicated to meeting the housing needs of all New Jersey residents and facilitating their realization of the American Dream. NJBA serves as a resource for its members through continuing education and advocacy. NJBA and its members strive for a better, greener, more affordable housing market in New Jersey. Additional information is available at NJBA.org.